Celebrate Easter with your class by writing about it. Included in this bundle are five quick-write tasks. 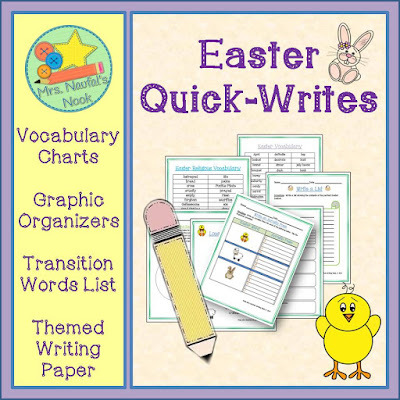 You will find an Easter Vocabulary chart, Religious Easter Vocabulary chart, a List graphic organizer for the perfect basket, an Easter paragraph template, an Acrostic poem template, an organizer to draw a Map and write directions to the Easter Bunny, a Comparison Graphic Organizer on Easter traditions, a transition word list and writing paper. These tasks are perfect for a bulletin board display or even a big class book. Silly sentences have always been a fun way to explore sentence building and recognizing parts of speech. Students in grades 3 through 6 will have the opportunity to use subject, verb and complement cards to build and simplify silly sentences. 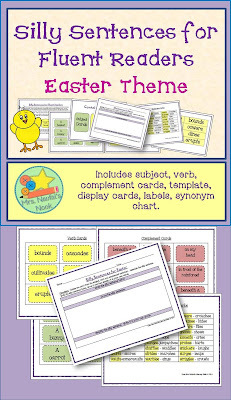 Challenging verb cards are included with this unit as well as nouns associated with the Easter theme, a blank sentence building template, display and label cards and a synonym chart. This is a perfect activity to use in your Word Work Stations or as an extra project for early finishers. 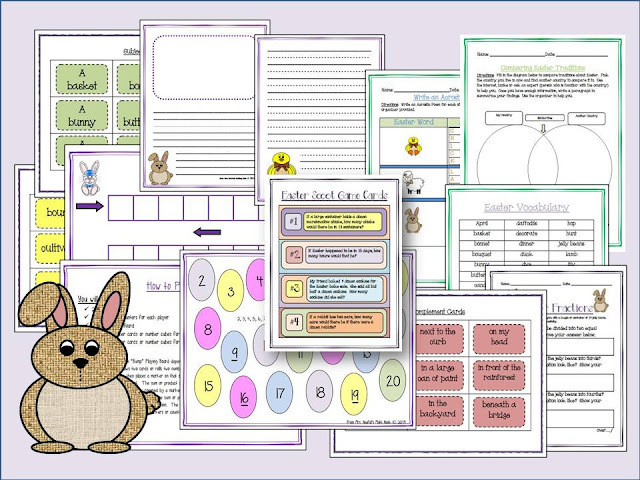 Celebrate Easter with this fun Easter Math Stations pack. You'll find three activities that focus on basic operations, word problems and fractions for a grade 4 to 6 classroom. 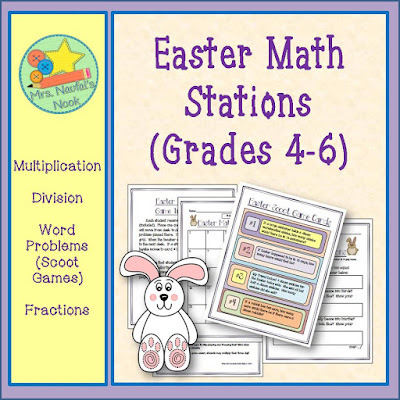 Activities include "Eggs in a Basket", "Easter Math Scoot Game" and "Easter Fractions". In "Eggs in a Basket", students are taught to generate three digit numbers and will multiply them by 12 or 10 to keep a running score. "Easter Scoot" is based on word problems that involve basic operations (with regrouping), money and time. Scoot cards are included for 25 to 30 students. The "scoot" cards can be used as task cards as well. The "Easter Fractions" activity allows students to derive ways to create fractions based on a given number of jelly beans. 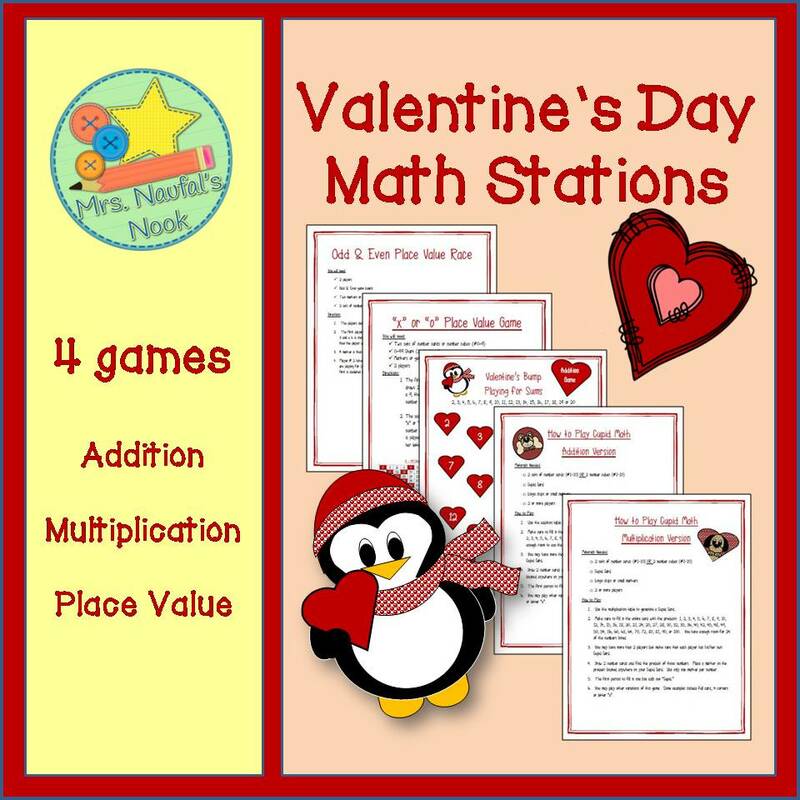 This pack includes directions, playing cards, scoreboards, multiplication table, scoot boards for 25 to 30 participants, word problems and answer keys. Enjoy Easter with some fun math games. Three stations are included in the pack. Activities include: Draw the Easter Bunny Math Challenge, Bump Games and Race to the Easter Egg. The Draw the Easter Bunny Challenge includes 2 versions (addition and multiplication). Students are asked to generate sums or products and then draw the Easter Bunny according to each sum or product generated. The first person to complete his or her picture is declared the winner. 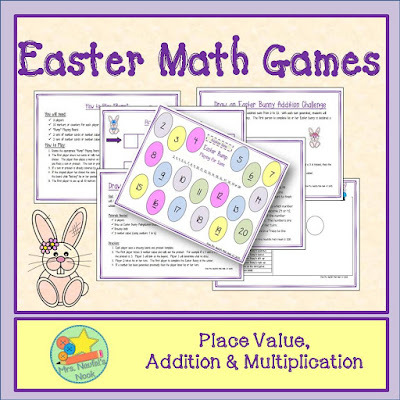 You will also find Bump Games using both addition and multiplication boards as well as a Race to the Easter Egg game that involves generating place value digits from 0 to 99. 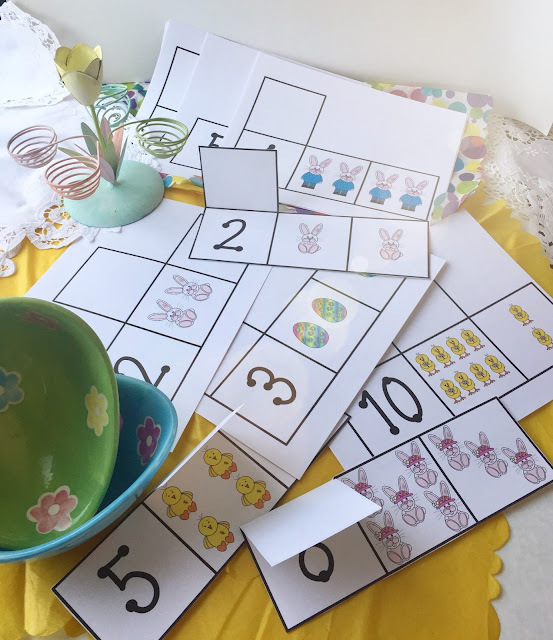 This is a great way to celebrate Easter with a math games day or a home-school connection. 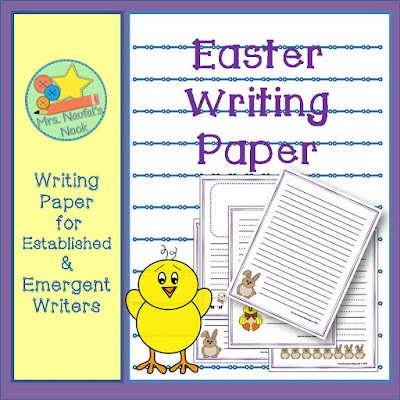 This package includes Easter writing paper for your Writing Station. 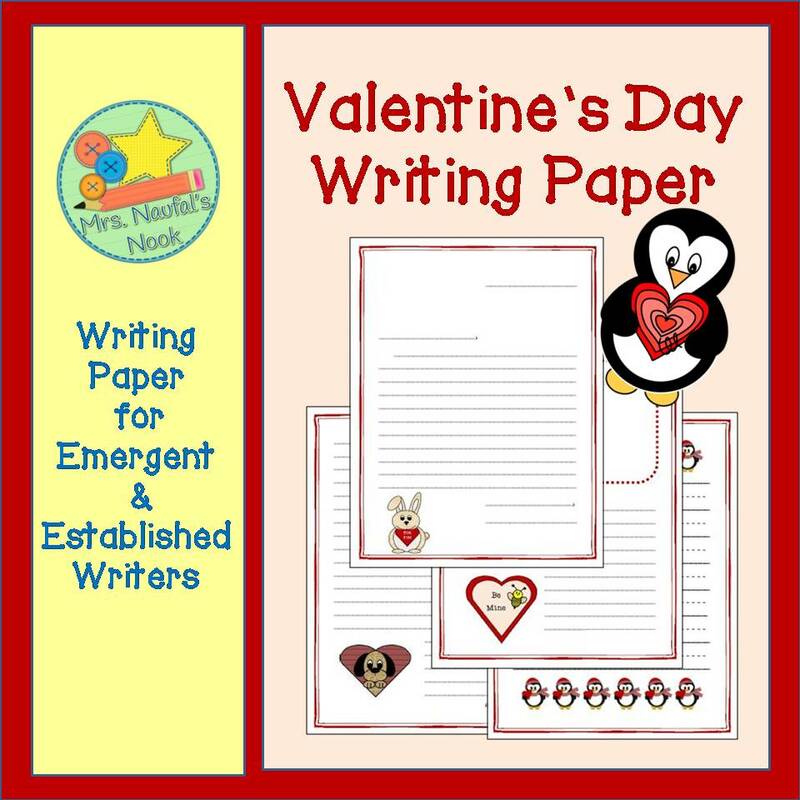 A selection of writing paper for emergent and established writers includes images of a bunny, lamb and a chick. 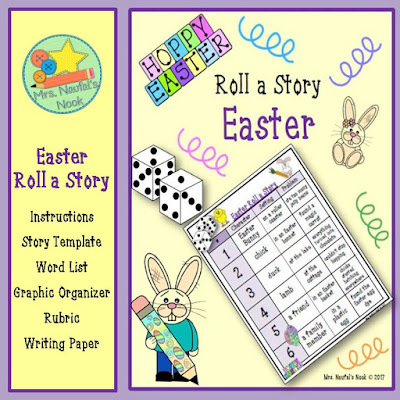 Students will be prompted to tell or write story with an Easter theme. 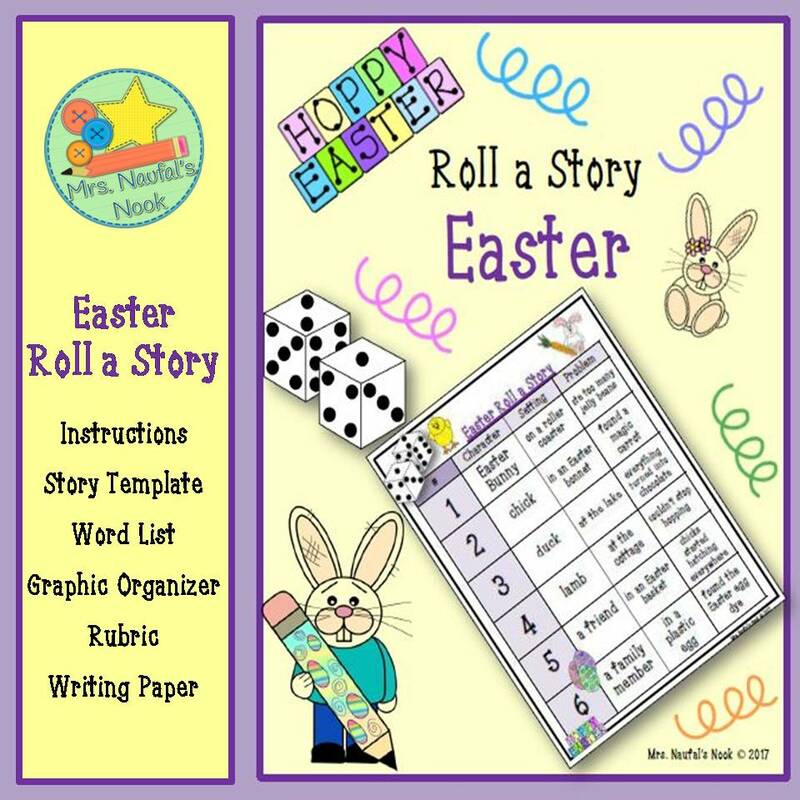 This unit includes a story prompt sheet, graphic organizers, word lists (Easter & transition words), rubric and specialty writing paper with full and half lined pages. Language Arts: Have students document and store memories using pictures, photos, letters, journals or videos. 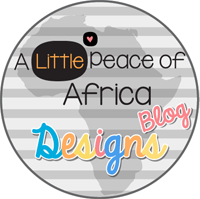 Visual Arts: Create a logo for a school department, a t-shirt or even a school fundraising project. Social Studies: Focus on one current event. Look at how the issue is broadcast in various ways. This is a great way to introduce comparing and contrasting as well. Math: Explore ratio, fractions, decimals and percentages of commercials to television shows; look at ratio of ads to newspapers or magazines. Science & Technology: Show how media assists in scientific discoveries or inventions. Explore news broadcasts, magazines or websites associated with science. Healthy Living & Social Responsibility: Is there gender bias in toys? Look at how advertisements (both commercial and non-commercial) portray toys. If you're teaching media literacy for the first time, have students begin with these advertisement posters. You'll find fifteen persuasive techniques included on a one page printable as well as display posters. 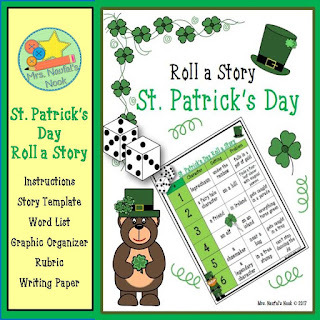 Students will be prompted to tell or write story with a St. Patrick's Day theme. 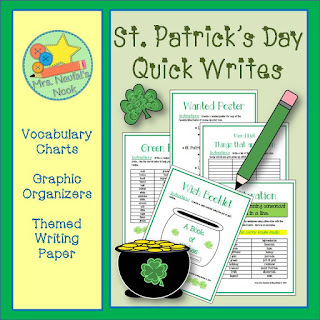 This unit includes a story prompt sheet, graphic organizers, word lists (St. Patrick's & transition words), rubric and specialty writing paper with full and half lined pages. All you need is a number cube (1-6). If you want a one day writing blitz or a variety of activities for stations, offer some quick writes to your students. This unit contains five writing ideas for your St. Patrick's Day writing stations or bulletin boards. These include Alliteration, Recipe Writing, Wanted Poster, Wish Booklet and Word Lists. St. Patrick's Day vocabulary and writing paper is included. 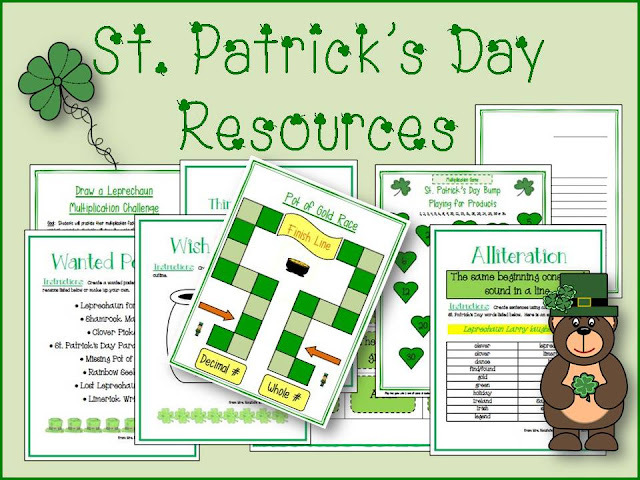 Enjoy St. Patrick's Day with some fun math stations. Four stations are included in the pack. Activities include: Draw a Leprechaun Math Challenge, A Pot of Gold Race, Bump Games and Race to the End of the Rainbow. The Draw a Leprechaun Challenge includes 2 versions (addition and multiplication). Students are asked to generate sums or products and then draw a leprechaun part according to each sum or product generated. The first person to complete his or her leprechaun is declared the winner. Pot of Gold Race involves generating quotients with two players. One plays for decimals, one plays for whole numbers. The first person to get to the pot of gold is declared the winner. You will also find Bump Games using both addition and multiplication boards as well as a Race to the End of the Rainbow game that involves generating place value digits from 0 to 99. 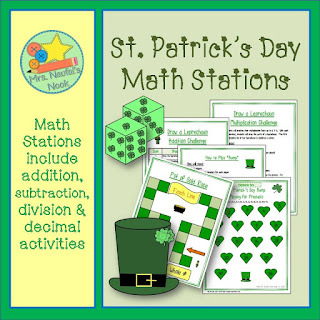 This is a great way to celebrate St. Patrick's Day with a math station day or a home-school connection. 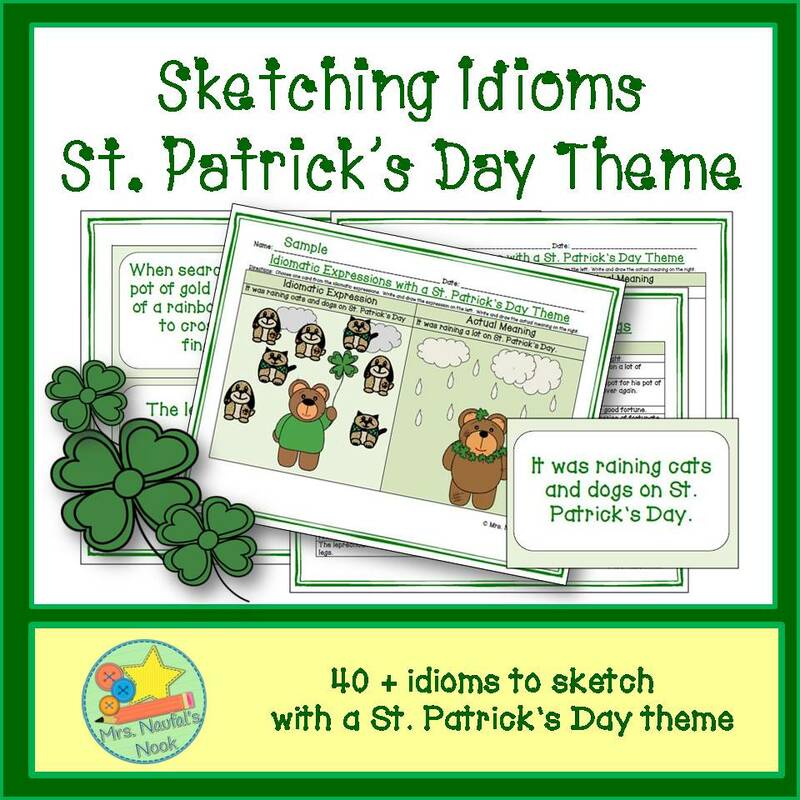 Here's a fun way to teach idioms to your students with a St. Patrick's Day theme. This unit has expressions on word cards ready for cutting and laminating. Students will be provided with a blank template and task cards filled with an expression related to a St.Patrick's Day theme. They will then be asked to sketch a situation using the idiomatic expression on the card and then write and sketch their interpretation of it. This is a great addition to your Word Work Station or can be used as an extra activity for early finishers. 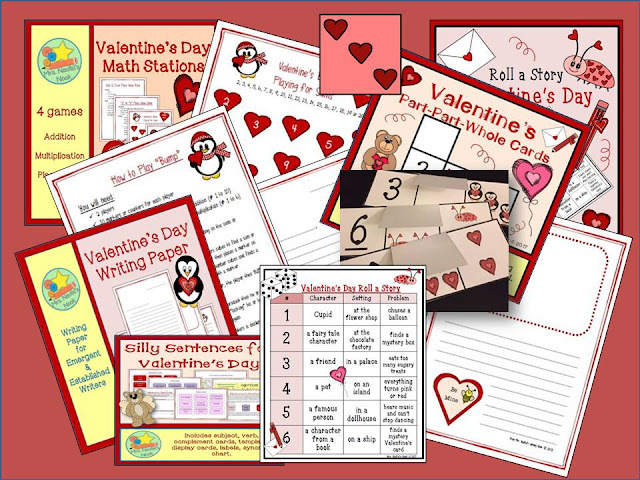 Using a Valentine's Day theme, students will have the opportunity to explore numbers. 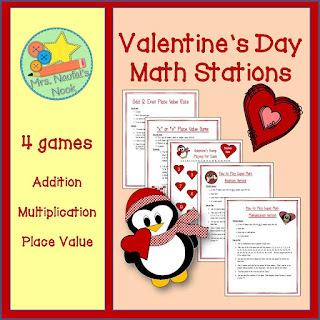 This unit contains four activities that are ideal for math stations or may be used as home-school connections. 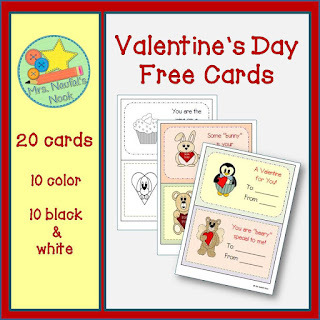 Activities include: "Cupid" (a math game that generates either sums or products), "Bump" using addition or multiplication, 2 place value games based on numbers 0 to 99. Playing cards, boards and full instructions are included. 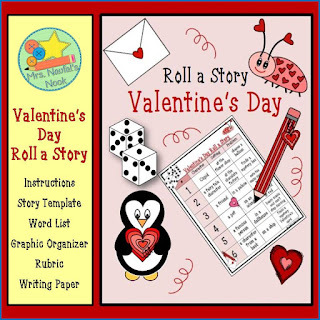 Students will be prompted to tell or write story with a Valentine's Day theme. 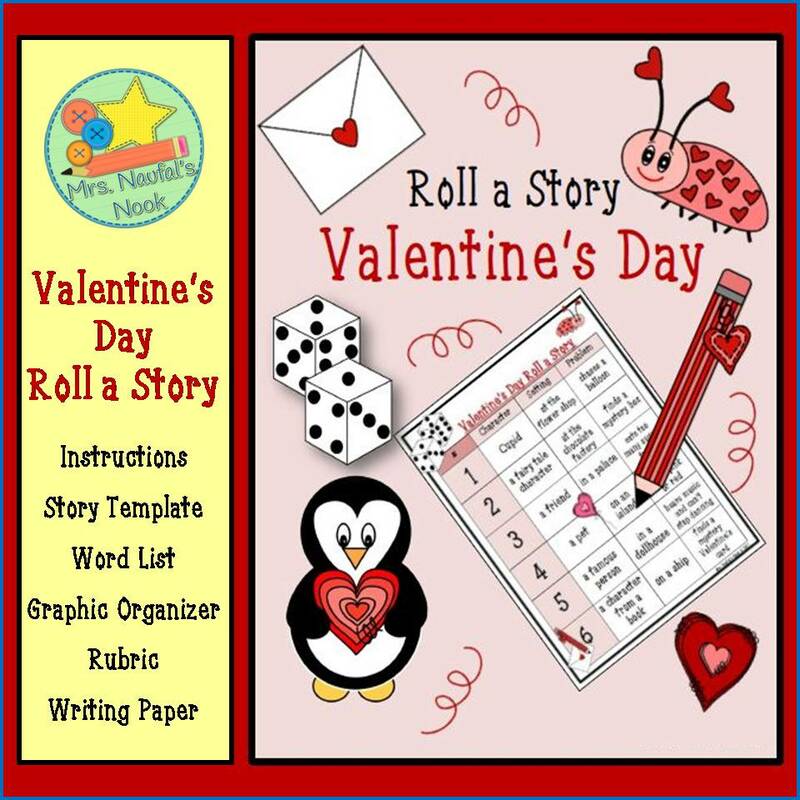 This unit includes a story prompt sheet, graphic organizers, word lists (Valentine's Day & transition words), rubric and specialty writing paper with full and half lined pages. Silly sentences have always been a fun way to explore sentence building and recognizing parts of speech. 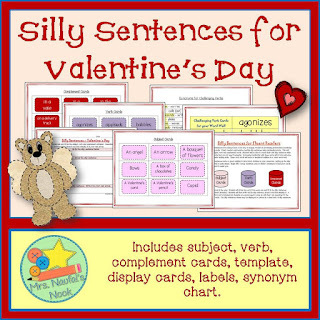 Students in grades 3 through 6 will have the opportunity to use subject, verb and complement cards to build and simplify silly sentences. 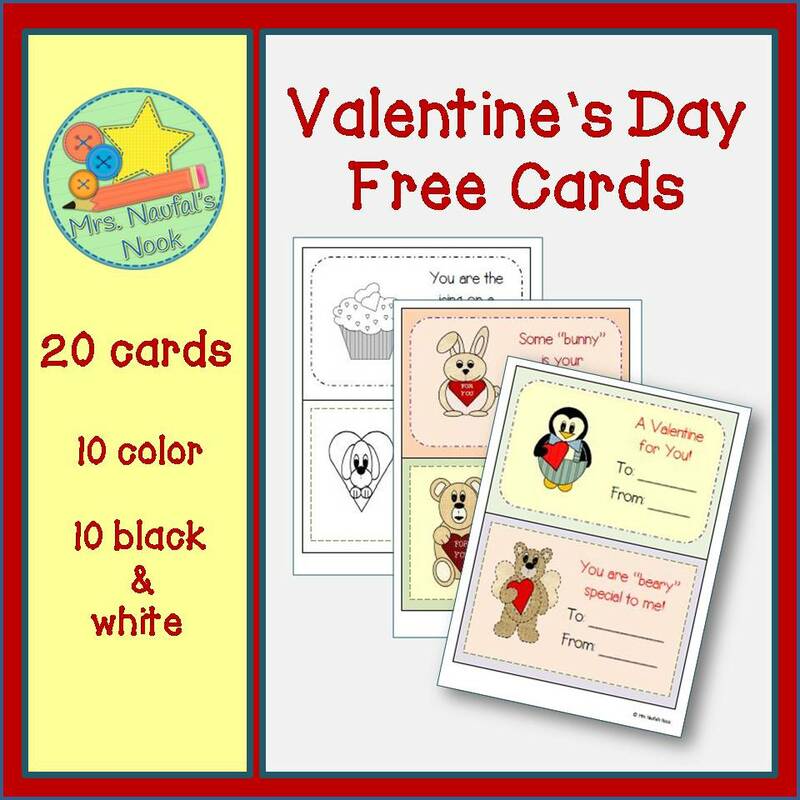 Challenging verb cards are included with this unit as well as nouns associated with the St. Valentine's Day theme, a blank sentence building template, display and label cards and a synonym chart. This is a perfect activity to use in your Word Work Stations or as an extra project for early finishers. 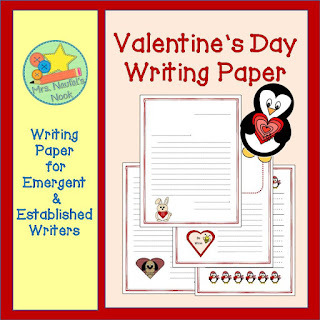 This package includes Valentine's themed letter writing paper and lined paper for emergent and established writers. Art work created includes a penguin, bunny, puppy and bear. Bonus gift tags included and note cards are included. 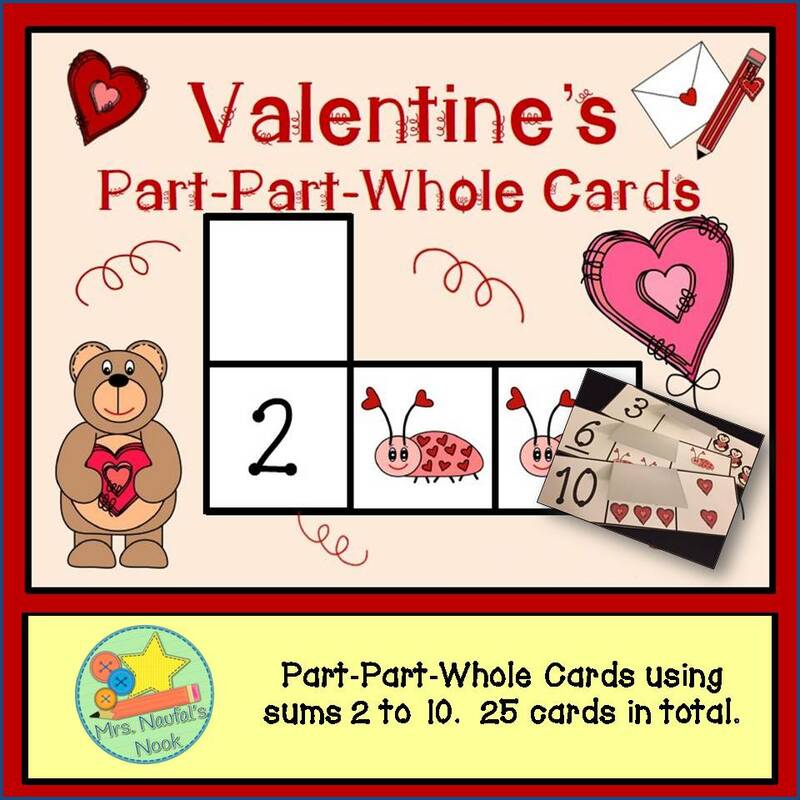 Valentine's Day Part Part Whole Cards (Great for a Math Chat)!!! Here's a fun way to assist students in computation of number sums either in math stations, with a buddy or for independent practice. 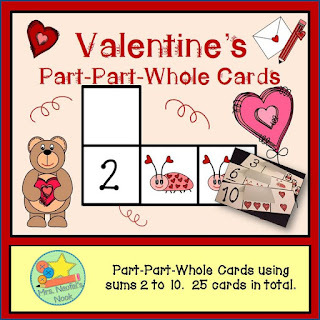 This unit of 25 part-part-whole cards will allow students to practice sums from 2 to 10 with a Valentine's theme. The unit includes 2 variations for the numbers 2 and 3 and 3 variations for the numbers 4 to 10. With numbers hidden with flaps, Students can then justify what the missing part is and lift the flap to verify their answers. Cards may be used during a number talks, during guided math groups or for individual assessments. 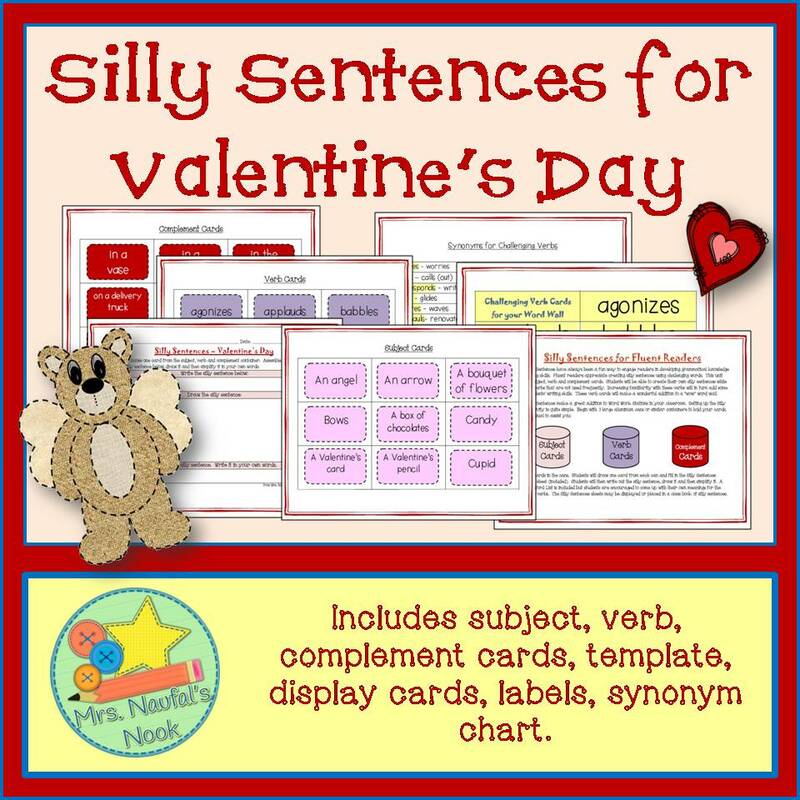 This is a writing task to assist students in exploring their senses on Valentine's Day . Students are asked to think about ways in which Valentine's Day allows them to see, hear, taste, touch and feel. A planning template and printable pages are included. Have students predict the outcome of Groundhog Day. Will spring arrive early or late? By placing two visual markers on the board, students can vote on their prediction. Several activities can take place after doing this. Students can tally their votes, create double bar graphs based on other classes' votes, work on decimals and percentages as well as fractions. Using some fun clip art images will help with the visual display. Groundhog Day Math Stations are a fun way to celebrate February 2nd. A Groundhog Day package of games includes 3 games. 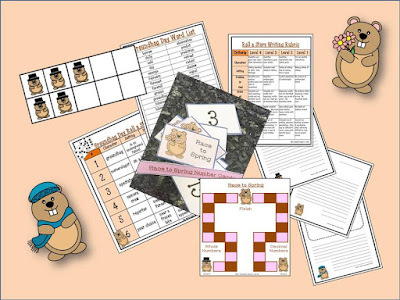 The first game involves drawing a groundhog based on products (for a multiplication game) or sums (for an addition game). The second game is called Race to 2. 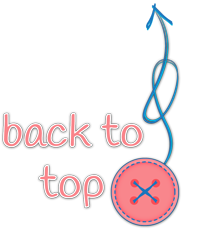 Students will use addition or subtraction to move their way back to the number 2 on a hundred chart. The first person to land on 2 is declared the winner. The final game is a race to spring. Whoever reaches the finish line first after dividing numbers is declared the winner. Quotients and outcomes are based on both whole and decimal numbers. For the younger students, Ten Frame Groundhog Day Clip Art images have been created. They can easily be placed on card stock and enlarged for a fun math talk. Roll a Story prompts students to tell or write story with a Groundhog Day theme. This unit includes a story prompt sheet, graphic organizers, word lists (Groundhog Day & transition words), rubric and specialty writing paper with full and half lined pages. All you need is a 1 to 6 number cube. If students want to continue writing, Groundhog Day themed writing paper is a fun way to display their creative work. Are you thinking about some ways to differentiate teaching that supports students in developing reading proficiency? This is something that I have struggled with over the years. A highly active classroom often gets the better of me and my independent reading practice goes by the wayside. The suggestions I provide are not foolproof but they are practical enough for anyone to implement. Once independent reading is established, the goal is to use this time to work on small group guided reading with your students. Begin by setting a time for uninterrupted reading. I usually do this for 20 minutes each day. Your students will thank you for it! 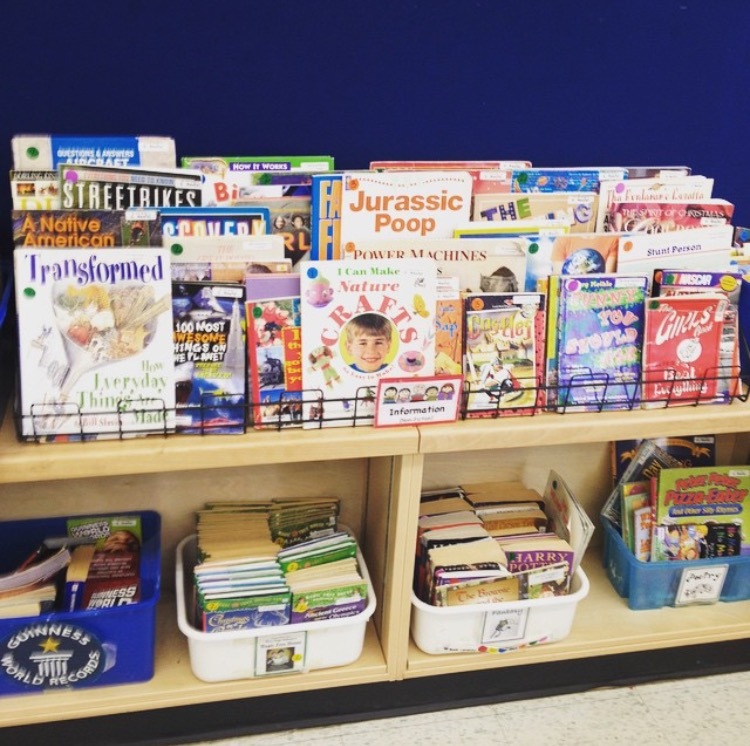 The "I don't know what to read" will diminish if you give students some choice. During the first week, we gather with a few read alouds. As I read aloud, I talk about ways I'm reading the book. This includes how I hold it, how I read the book jacket, looking for the copyright date, the author, the illustrator and even where it was published. Students love when we can find out "how old the book is." I then ask students to select books they may be interested in reading from the classroom library. The library is filled with bins and labelled genres. Students are asked to choose 5 books to read at the beginning of the week. They are then placed in labelled magazine box holders with students' names on them. 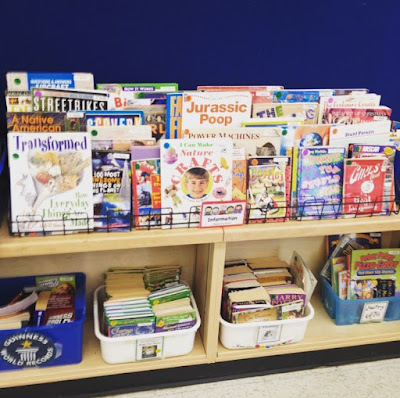 Choosing 5 books allows them to not travel back and forth to the classroom library. They have chosen 5 books just incase one is not appropriate. Books range from graphic novels, reading series, sports, hobbies, science, math etc. I often keep double copies of my read aloud so that one goes back in the classroom library. Sticky fingers off my own read aloud selection! We create an anchor chart for what Independent Reading looks like, sounds like and feel like. I model Independent Reading time. I often invite another teacher in to demonstrate or a student I taught from the previous year. Once students "see" the process, they are able to co-construct an anchor chart. Over the next few days, during independent reading time, I interview each student. I can usually get through 5 a day. This involves taking a reading interest inventory. This practice allows me to know what the students might be interested in reading. Often they have repeatedly said "I don't know what to read" or "I don't like reading." They slowly realize that they do have an interest in some genre. When I know what that is, I make an effort to stock my classroom library with things they will like. Once independent reading time routines are in place, I can begin working on exploring reading levels through running records. This usually happens during the second or third week of school. Within the first month, reading interests are discovered as well as reading levels. I am then able to focus on my guided reading groups during independent reading time. It's that time of year again! The TpT Focused Success group is bringing some fabulous dollar deals your way for two days only!